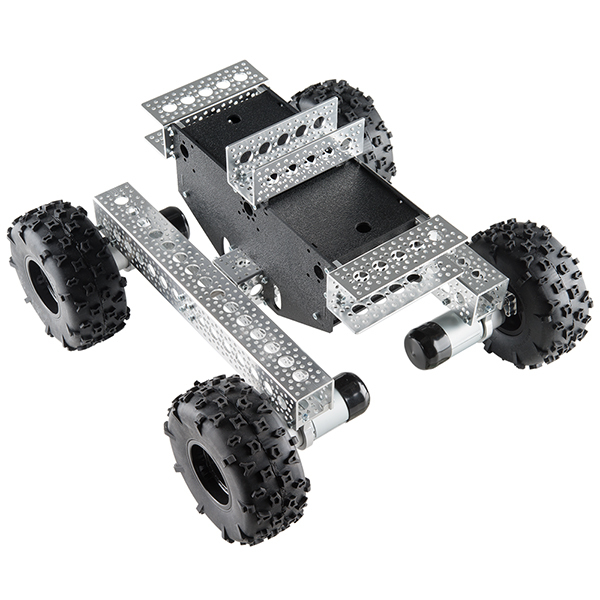 This is the 4WD Off-Road Chassis kit from Actobotics, a remarkably easy to assemble robotic platform capable of taking you places normal chassis can’t go. What makes this chassis kit great is not only its vast amount of attachment points for various add-ons, but also the fact that it is easily and fully configurable to fit your needs! Do you need the off-road wheels a different distance apart from one another? Do you need to switch out a motor due to damage or situational requirements? Do you need a different type of channel or panel attached to the main body for more attachment points? All of this can be done with a simple hex key and a few minutes. This chassis is equipped with four 5" diameter by 2.25" wide heavy duty wheels, four super duty planetary gearmotors with full metal gears and a ball-bearing pivot suspension. Also included in the 4WD Off-Road Chassis kit is a large central ABS plastic body with two large access panels that open up to a cavity large enough for a 7.2V NiCAD/NiMH or other lipo battery and electronics to fit comfortably. This central body also has a multitude of 0.77" hub patterns, cutouts at the bottom to run motor wires through, and since it is made out of ABS plastic drilling holes for additional mounting options is a breeze. Note: This comes as a kit and requires basic assembly. Note: This kit is for preorder. We expect stock within a week or two.